hotel BLUE Resort is Captain’s Quarters other building. Located just two blocks away, this Myrtle Beach resort features a swim-up pool bar, indoor lazy river, indoor and outdoor hot tub as well as a lobby bar and café that proudly serves Starbucks coffee. Guests of Captain’s Quarters Resort are welcome to use hotel BLUE’s amenities at any time during their stay. 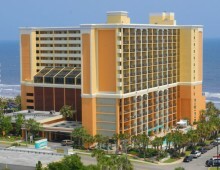 Landmark Resort is located just a few blocks south of Captain’s Quarters Resort. This oceanfront resort features many water amenities. From lazy rivers to indoor and outdoor pools, families will enjoy all that Landmark has to offer. In addition to its oceanfront water amenities, Landmark also has on-site mini-golf and a waterpark across the street. Dining options are also plentiful as guests have access to both seasonal and year-round dining outlets. 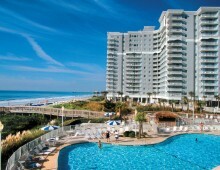 The Palace Resort is also located on the south-end of Myrtle Beach. This oceanfront resort has an outdoor pool, and sauna, as well as a putting green for the golfers in the family. Palace Resort features a variety of accommodations, from oceanfront to angle ocean view. Palace Resort is a great option for guests looking for larger units such as two-bedroom condos. Crown Reef Resort, located south of Captain’s Quarters Resort, is a large oceanfront resort that is perfect for families. Crown Reef also has seasonal summer events and an array of water amenities for guests to enjoy including a 575-foot lazy river, pools inside and out, and a new oceanfront waterpark! Crown Reef Resort is also the second location of Loco Gecko Beach Shak and offers a game zone, ice cream shop and more. 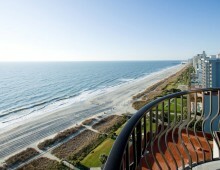 Palms Resort is a short drive north from Captain’s Quarters, not far past the north-end of the Myrtle Beach Boardwalk. This sister resort features two towers and is great for families looking for a quiet vacation. Guests at the Palms can stay on-site and enjoy their indoor and outdoor pools and indoor kiddie pool or head out onto the beach for a day of fun. 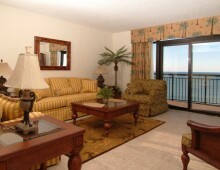 Beach Colony Resort is similar to Captain’s Quarters in that it features lots of fun for the family. With an array of water features including indoor and outdoor pools, lazy river, ice cream and snack bar, racquetball court and children’s daily summer activities, this Myrtle Beach resort is perfect for a family vacation. South Wind on the Ocean features luxurious rooms for single families to large groups. Accommodations are available up to five-bedrooms, which are perfect for large families and extended families that are vacationing in Myrtle Beach. This resort is located in the middle area of Myrtle Beach and is home to 80 and 90-foot outdoor pools, several whirlpools and a lazy river. Forest Dunes Resort is located in a quieter, more residential area of Ocean Boulevard in Myrtle Beach. This resort is equipped with one-bedroom suites, a two-bedroom penthouse and three-bedroom condos, perfect to fit any size family. A great resort for couples, adults, and families with young children, Forest Dunes has an indoor and outdoor pool, a lazy river, game room and more. The Caravelle Resort is located north of Captain’s Quarters, at 69th Avenue North. A popular family and golf resort, this sister resort has seasonal family events. 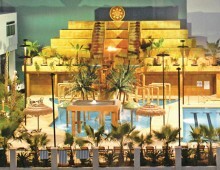 The Caravelle has plenty of water features including the block-long poolscape and 7th floor indoor pool. Because The Caravelle Resort is made up of its main building as well as several smaller surrounding buildings, they have a wide variety of accommodations and price options for families. A resort where you will feel like part of the family, Carolina Winds is located north of Captain’s Quarters Resort. Complete with a giant outdoor pool, outdoor lazy river and indoor pool; this resort also has free tennis. 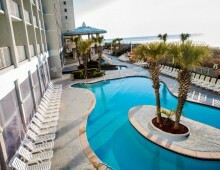 Accommodations at this Myrtle Beach resort include suites and two and three-bedroom condos which are perfect for any family. 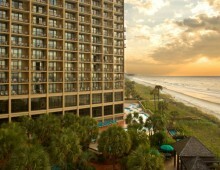 Ocean Creek Resort is a 57-acre gated resort. Complete with peace and quiet, tranquil settings and beach access, this family resort is perfect for a Myrtle Beach vacation. Ocean Creek Resort’s accommodations include oceanfront tower condos, as well as lodges and villas that are set back from the oceanfront. Ocean Creek features multiple pools, a playground, tennis courts and plenty of paths for an afternoon stroll. 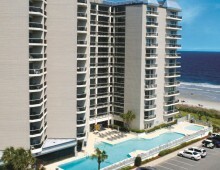 Beach Cove Resort is located in North Myrtle Beach, about 40 minutes north of Captain’s Quarters. Beach Cove offers all oceanfront units ranging from one-bedroom suites up to three-bedroom condos, making it great for larger families. From four outdoor pools, to a 350-foot lazy river to an indoor pool, it’s a great place for families to have fun in the sun. Beach Cove also has an arcade, a racquetball court, oceanfront Town Center and more. Located on the north end, Sea Watch Resort is a fun family resort. 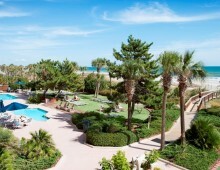 A short drive from Barefoot Landing, this is a popular resort for weddings, group events and family vacations. 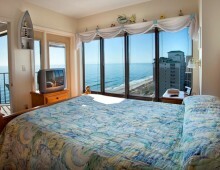 With units ranging from studios to large three-bedroom condos, Sea Watch can fit many types of families. Kids and adults alike will have fun in the six pools, two lazy rivers and multiple hot tubs. Sea Watch offers breakfast with a view, overlooking the pool deck and the ocean.